We strive to provide reliable, objective salary and benefit data nonprofits can use to set appropriate pay and benefits for staff and new hires, and justify compensation levels to the public and the IRS. 2018 Report on Nonprofit Wages + Benefits Now Available! The 2018 report is based on data from 310 reporting Maine nonprofits that provided data on wages for 6,812 full-time and 294 part-time employees across 32 job categories during the spring and early summer of 2018. The report includes Maine-specific data as well as regional comparisons with our partners from New Hampshire and Vermont. 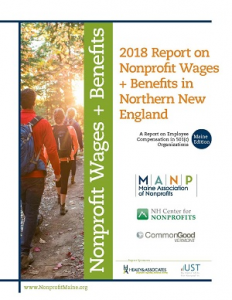 Download the free 2018 Snapshot of Nonprofit Wages + Benefits in Maine. Read the Bangor Daily News coverage of the report’s findings. Read NonprofitQuarterly’s analysis of the report’s findings. *Participating organizations received a discount code by email to use in ordering their copy. If you did not receive this, please contact us at manp@nonprofitmaine.org. This year’s survey is a joint effort with the NH Center for Nonprofits, CommonGood Vermont, and the New Hampshire Survey Center. Thank you to our 2018 report sponsors! 2016 Report – This report is based on data from 278 reporting Maine nonprofits who provided data on wages for 7,655 full-time and 274 part-time employees across 32 job categories during the spring and early summer of 2016. The report includes Maine-specific data as well as regional comparisons with our partners from New Hampshire and Vermont. Download a free snapshot of the 2016 report. Order a copy of the 2016 report. Members automatically receive 50% off the cover price of $250. 2016 participants were sent a code to order their free or reduced fee copy. Note: This is an electronic publication. After ordering, you will receive details about how to access your copy. The 2016 report is also available for review in a number of libraries around the state. Contact our Membership Manager to see if it is available at a library near you. 2014 Report – This report is based on data from 408 reporting Maine nonprofits who provided data on wages for 8,816 full-time and 328 part-time employees across 32 job categories during the spring of 2014. The report includes Maine-specific data as well as regional comparisons with our partners from New Hampshire and Vermont. The 2014 report is also available for review in a number of libraries around the state. Download the list of library locations. Using Salary Surveys Effectively, Lynn Breckinridge, Breckinridge Consulting. A more in-depth article about when and how to use salary surveys as a tool. Find more resources in our free, searchable Answer Center.